Yesterday I travelled to Brisbane to take the Cisco CCNP TSHOOT exam. I passed with a score of 986/1000, which I was pleased about. The exam was mostly trouble tickets and problem solving, which is what I've spent the last 15 years doing, so a poor score would have been disappointing. 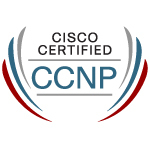 Anyway, this was the final exam required for my CCNP certification, and this morning I got the confirmation email informing me that I indeed have completed the requirements for the CCNP. Thus I was able to download the next set of logos, so here it is. Now I need to figure out what I am going to do next. Should I do some of the specialization certifications or try for the CCIE? Not entirely sure yet. I'll keep you posted.